Sigrid the Haughty, also known as Sigríð Storråda (Sigrid Storråda in Swedish), is a queen appearing in Norse sagas as wife, first of Eric the Victorious of Sweden, then Sweyn Forkbeard of Denmark. Sigrid appears in many sagas composed generations after the events they describe, but there is no reliable evidence as to her existence as they describe her. The figure of Sigrid appears mainly in late Icelandic sagas, while more contemporary sources such as Thietmar of Merseburg and Adam of Bremen instead claim that Sweyn was married to a Polish princess, identified as Świętosława. Snorri Sturluson gives conflicting information and in one place says that Sweyn was married to Sigrid and in another that he was married to a Gunhild of Wenden. It is unclear if the figure of Sigrid was a real person, if the saga account of her is an amalgamation of the lives and deeds of several women, or if she is a completely fictional character. The latter view is held by some modern scholars, who do not give credibility to Sigrid's legacy in old Nordic sources and thus consider it a myth. Heimskringla describes Sigrid as the beautiful but vengeful daughter of Skogul-Tosti, a powerful Swedish nobleman. As widow of Eric the Victorious, she held many great estates, and was living with her son Olav the Swede, when her foster-brother Harald Grenske, a king in Vestfold, sought her hand. She had him and another royal wooer, Vissavald of Gardarik, burned to death in a great hall following a feast to discourage other suitors. This episode earned her her byname. Her hand was next sought by Olaf Tryggvasson, the king of Norway, but he would have required that she convert to Christianity. She told him to his face, "I will not part from the faith which my forefathers have kept before me". In a rage, Olaf struck her with a glove, and Sigrid calmly told him, "This may some day be thy death". Sigrid then proceeded to create a coalition of his enemies to bring about his downfall. She allied Sweden with Denmark, marrying the widower Sweyn Forkbeard who had already been feuding with Olaf. Sweyn had sent his sister Tyri to marry the Wendish king Burislav, who had been the father of Sweyn's first wife, Gunhild. Tyri fled and married Olaf, goading him into conflict with her brother, while Sigrid inflamed Sweyn against her former suitor. This shared animosity would lead to the Battle of Swold, in which Olaf fell. Snorri also claims that Estrid Svendsdatter was a paternal sister of Cnut the Great, and as a daughter of Sigrid was maternal sister to Olav the Swede, but in another place says that Estrid was a daughter of Gunhild of Wenden. The Danish historian Saxo Grammaticus would repeat this information, writing that Eric the Victorious' widow Syritha had married Sweyn Forkbeard after having spurned Olaf Trygvasson. One further point that has been cited in favor of Sigrid's historical existence is that the holdings of the Danish kings in medieval Sweden were known as "Syghridslef" - 'the legacy of Sigrid'. Thietmar of Merseburg mentions that the daughter of Mieszko I of Poland and sister of Bolesław I Chrobry of Poland married Sweyn Forkbeard and gave him two sons, Cnut the Great and Harald II of Denmark, but he does not mention her name. Thietmar is probably the best informed of the medieval chroniclers addressing the question, since he was contemporary with the events described and well-informed about the events in Poland and Denmark. The assertion that Harald's and Canute's mother was Boleslaw's sister may explain some mysterious statements which appear in medieval chronicles, such as the involvement of Polish troops in invasions of England. Adam of Bremen writes almost a century later that a Polish princess—the sister or daughter of Bolesław I Chrobry of Poland—was the wife of Eric the Victorious and by this marriage the mother of Olof Skötkonung of Sweden, before she became mother of Cnut the Great and Harald II of Denmark in her second marriage with Sweyn. Adam's claims about the marriage to Eric are considered unreliable by many historians, since he is the only source to state this relationship and because he is writing several generations later. The scholia of Gesta Hammaburgensis Ecclesiae Pontificum mentions that it was the Polish king Boleslaw who gave the princess' hand in marriage. One problem is that Olof was born at latest in the early 980s, before Boleslaw Chrobry came to power, and therefore was too old to be the unnamed princess's son. 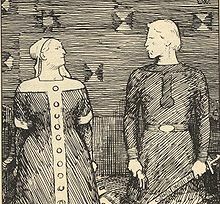 During this time, marriages between Nordic monarchs and Vendic nobles was reoccurring for political reasons. For instance, Tove of the Obotrites, daughter of the Vendic lord Mistivoj, married King Harald Bluetooth of Denmark in the 960s. Gesta Cnutonis regis mentions in one short passage that Canute and his brother went to the land of the Slavs, and brought back their mother, who was living there. This does not necessarily mean that his mother was Slavic, but nevertheless this chronicle strongly suggests that she was. These data have been used for alternative reconstructions. One would interpret the saga account of Sigrid as a confused rendering of a princess, Świętosława, daughter of first duke of the Polans Mieszko I, who married in succession Erik and Sweyn, being mother of Olaf (by Erik), Harald and Cnut (both by Sweyn). Sigrid would be either a contemporary name adopted by the Princess to conform to her new linguistic context, or else simply a name invented by saga writers who did not know or could not comprehend her Slavic name. This solution may further make her identical to Sweyn's first queen in the saga, 'Gunhild', daughter of Burislav, suggested to be a confused rendering of the same historical marriage to the sister of Boleslav of Poland. Alternatively, the attributed Polish marriages of Sweyn and Eric may have been to different women, with Gunhild being the daughter of Mieszko, while Eric's widow, a distinct princess and the model for Sigrid, married Sweyn after her. Finally, some consider Sigrid to be a fantasy created by Scandinavian saga writers. Further confusion has been introduced by dated interpretations of an archaeological discovery. In 1835, the Haraldskær Woman was discovered in a peat bog in Jutland. This body of a woman was dated to the 11th century, and it was identified with Sigrid (or Gunhild). Radiocarbon dating later proved this dating incorrect, that the remains are much older. However, the erroneous dating became intertwined with numerous episodes of Scandinavian intrigue, as the theory was elaborated to serve a variety of agendas of kings and nobles prior to its redating. Karen Blixen, in the short story "The Deluge at Norderney" in Seven Gothic Tales, refers to Sigrid, claiming that she invited all her suitors to her house and burned them in order to discourage other suitors. Oswald Balzer, Genealogia Piastów, Kraków 1895. Andrzej Feliks Grabski, Bolesław Chrobry. Zarys dziejów politycznych i wojskowych, Warsaw 1964. Kazimierz Jasiński, Rodowód pierwszych Piastów, Warsaw-Wrocław (1992). ^ Paweł Jasienica, Ostatnia z rodu, Pruszyński i S-ka, Warszawa 2009, s. 113.